What causes a heat-related illness? Hyperthermia is overheating of the body. Heat-related illness occurs as a result of heat exposure. Heat stroke is the most severe form of heat-related illness, and requires immediate medical attention. Certain individuals, such as the elderly, infants and young children, the obese, outdoor workers, and those with chronic medical conditions are at increased risk for developing heat-related illness. Prevention of heat-related illness is best accomplished through proper planning and preparation, such as increasing fluid intake, wearing appropriate clothing and sunscreen, remaining in a cool environment, acclimating yourself to the hot environment, and using common sense. A heat-related illness is a medical condition that may occur as a result of heat exposure. Even short periods of high temperatures can cause serious health problems. Heat-related illness encompasses a spectrum of conditions that range from minor illnesses to life-threatening medical emergencies. There are several heat-related illnesses, including heat stroke, heat exhaustion, heat cramps, heat syncope (fainting), and heat rash. Summer can bring heat waves with unusually high temperatures that can last for days and sometimes weeks. According to statistics from the Centers for Disease Control and Prevention (CDC), there were 7,415 death due to heat-related illness in the United States from 1999 to 2010, or an average of approximately 618 death per year. Heat waves lead to more deaths annually in the United States than tornadoes, earthquakes, floods, and hurricanes combined. In the summer of 1980, a severe heat wave hit the United States, and approximately 1,700 people lost their lives from heat-related illness; and in the summer of 2003, tens of thousands of people died in Europe from an extreme heat wave. The summer of 2012 heat wave in the United States led to many heat-related deaths, and numerous all-time high temperature records were broken throughout the United States. Most recently, a summer heat wave in Pakistan in 2015 led to more than 1,000 fatalities. High temperatures put people at risk. Did You Know You Could Die From a Heat-Related Illness? Heat Rash: Heat rash looks like a red cluster of pimples or small blisters. Heat exhaustion is a warning that the body is getting too hot. Heat stroke is a serious, life-threatening condition that occurs when the body loses its ability to control its temperature. People suffer heat-related illness when the body's normal temperature control system is unable to effectively regulate its internal temperature. Normally, at high temperatures the body primarily cools itself through the evaporation of sweat. However, under certain conditions (air temperatures above 95 F/35 C high humidity), this cooling mechanism becomes less effective. When the humidity is high, sweat will not evaporate as quickly, preventing the body from releasing heat quickly. Furthermore, without adequate fluid intake, excessive fluid losses and electrolyte imbalances may also occur leading to dehydration. In such cases, a person's body temperature rises rapidly. Very high body temperatures can damage the brain and other vital organs. Other conditions that can limit the ability to regulate body temperature include old age, obesity, fever, dehydration, heart disease, poor circulation, sunburn, and drug or alcohol use. people who are chronically ill or on certain medications. Infants and children up to four years of age are very sensitive to the effects of high temperatures and rely on others to regulate their environment and to provide adequate fluid intake. Moreover, they have a higher metabolic rate and inefficient sweating compared to adults. People 65 years of age or older may not compensate for heat stress efficiently, and are less likely to sense and respond to changes in temperature. The elderly population also is at a higher risk because they usually have other pre-existing medical conditions, and they often take medications that can make them more vulnerable to dehydration (for example, diuretics). Overweight individuals may be prone to heat-related illness because of their tendency to retain more body heat. Signs and symptoms of heat-related illness vary based on the severity of the illness. 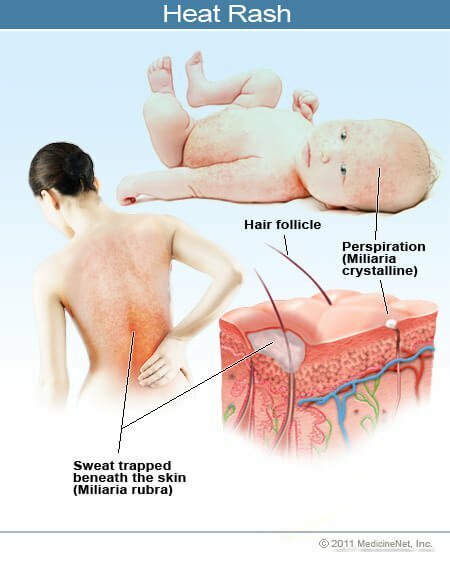 Heat rash symptoms: red bumps on the skin, a feeling of prickly or itchy skin. Heat syncope (fainting) symptoms: dizziness or lightheadedness and fainting, generally due to prolonged exposure to heat, dehydration, or orthostatic hypotension. Heat cramps symptoms: significant sweating, involuntary spasms of the muscles in the body, most often affecting the legs. Heat exhaustion symptoms: nausea and vomiting, headache, muscle cramps, weakness, and profuse sweating. Heat stroke symptoms: dizziness, muscle cramps and aches, nausea and vomiting, fatigue, headache, weakness, confusion and coma. Heat stroke is a medical emergency. Heat stroke is a medical emergency requiring immediate medical attention. It is the most severe form of heat-related illness, and it can sometimes lead to death or permanent disability. Heat stroke occurs when the body's ability to regulate its internal temperature has failed. The body's temperature rises rapidly in excess of 104 F (40. C), leading to damage to the brain and other vital organs. Generally, the extent of injury depends on the duration of exposure to excessive heat and the peak temperature attained. Heat stroke is sometimes referred to as sunstroke. Heat stroke can be categorized as either exertional heat stroke (EHS) or nonexertional heat stroke (NEHS). Exertional heat stroke generally occurs in young, healthy individuals who engage in strenuous activity in hot weather. Nonexertional heat stroke (also referred to as classic heat stroke) typically occurs in the elderly, the very young, or the chronically ill.
Get the person to a cool indoor or outdoor area and remove restrictive clothing. Cool the person rapidly using whatever methods you can. For example, if possible, immerse the person in a tub of cool water or place them in a cool shower. You may also spray them with lukewarm water and blow cool air from a fan towards them. If the humidity is low, loosely wrap the person's body in a cool, wet sheet and fan him or her vigorously. Alternatively, place ice or cold packs to the armpits, neck, and groin areas. Monitor body temperature, and continue cooling efforts until the body temperature drops to about 102 F or lower (38.8 C), in order to prevent overcooling the affected individual. If the affected individual is awake and alert, give them cool fluids to drink. Do not give them alcohol to drink. If the affected individual's muscles begin to twitch uncontrollably (seizure) as a result of heat stroke; keep the individual from injuring themselves, and do not place any object in the mouth and do not give fluids. If there is vomiting, make sure the airway remains clear by turning the person on their side to prevent choking. Heat cramps usually affect people who sweat significantly during strenuous activity. This sweating depletes the body's salt and moisture. The low salt level in the muscles causes painful muscle cramps, often following exercise. Heat cramps may also be a symptom of heat exhaustion. Heat cramps are muscle pains or muscle spasms (usually in the abdomen, arms, or legs) that may occur in association with strenuous activity. If the affected person has heart problems or are on a low sodium diet, seek medical attention for heat cramps. Stop all activity, and sit and rest in a cool place. Drink water or a sports beverage, and eat a salty snack. Passively stretch the affected muscles. Do not return to strenuous activity for a few hours after the cramps have subsided as further exertion can lead to heat exhaustion or rarely, heat stroke. Heat exhaustion is the body's response to an excessive loss of water and salt contained in sweat as a result of engaging in physical activity (work or exercising) in a hot environment. The body temperature may be normal or mildly elevated, but not above 104 F (40 C). It often occurs in individuals who are not accustomed to working or exercising in the heat. The symptoms may range from minor complaints to more pronounced symptoms, however the affected individual will not experience the central nervous system manifestations noted with heat stroke. Many cases of heat exhaustion can be treated outside of the hospital setting however it is important to understand that heat exhaustion can progress to heat stroke if not properly addressed in a timely fashion. The skin may be cool and moist. The affected individual's pulse rate may be fast, and breathing may be fast and shallow. If heat exhaustion is untreated and heat exposure continues, it may sometimes progress to heat stroke. loosen or remove restrictive clothing. the affected individual has serious underlying health problems (for example, heart disease or diabetes). Otherwise, help the person cool off, and seek medical attention if symptoms worsen or last longer than one hour. Heat syncope is a fainting episode that occurs in the heat, either during prolonged standing or exercise, or when rapidly standing from a lying or sitting position. It typically occurs in individuals who are not acclimatized to the heat. Dehydration can also contribute to this condition. What are the signs and symptoms of heat syncope? What is the treatment for heat syncope? Sit and rest in a cool place. The affected individual may also lie down and elevate the legs above the level of the heart. Drink water or a sports beverage. Seek immediate medical attention for repeated episodes of fainting, or if the individual experiences chest pain, seizures, or confusion. Heat rash is a skin irritation that occurs in hot, humid weather. 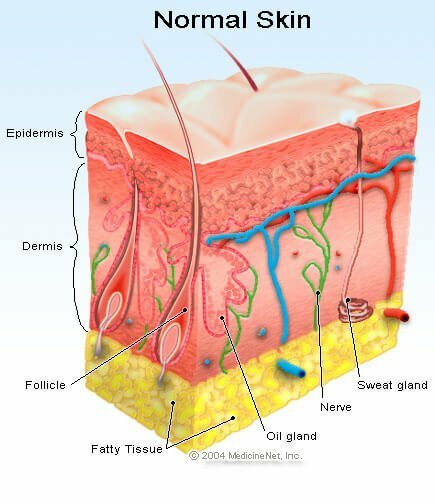 It is caused by profuse sweating, which can lead to the blockage of sweat ducts. It can occur at any age, but is most common in young children. Heat rash appears as a cluster of small red pimples or blisters. This skin irritation can be itchy. It typically occurs on the neck and upper chest, in the groin, under the breasts, and in the elbow creases. The best treatment for heat rash is to avoid a hot, humid environment and to try to remain in cooler, less humid conditions. Try to keep the affected area dry, and wear light, loose clothing. Dusting powder may be used to increase comfort, but avoid using ointments or creams because they keep the skin warm and moist and may make the condition worse. Increase your fluid intake regardless of your activity level. Do not wait until you feel thirsty. During heavy exercise in a hot environment, drink 2-4 glasses (16-32 ounces) of cool fluids each hour. Caution: If your doctor has prescribed a fluid-restricted diet or diuretics for you, ask your doctor how much you should drink. During hot weather, you will need to drink more liquid than your thirst indicates. This is especially true for people 65 years of age and older who often have a decreased ability to respond to external temperature changes. Drinking plenty of liquids during exercise is especially important. However, avoid very cold beverages because they can cause stomach cramps. In addition, avoid drinks containing alcohol or caffeine, because they will actually cause you to lose more fluid. Heavy sweating removes salt and minerals from the body. These are necessary for your body and must be replaced. The easiest and safest way to replace salt and minerals is through your diet. Drink a sports beverage during exercise or work in the heat. Do not take salt tablets unless directed by your doctor. If you are on a low-salt diet, ask your doctor before changing what you eat or drink, especially before drinking sports beverages. Wear as little clothing as possible when you are at home. Choose lightweight, light-colored, loose-fitting clothing. In the hot sun, a wide-brimmed hat will provide shade and keep the head cool. Sunburn affects the body's ability to cool itself and causes a loss of body fluids. It also causes pain and damages the skin. A variety of sunscreens are available to reduce the risk of sunburn. The protection that they offer against sunburn varies. Check the sun protection factor (SPF) number on the label of the sunscreen container. Select SPF 15 or higher to protect yourself adequately. Apply sunscreen 30 minutes before going outdoors and reapply according to package directions. If you are unaccustomed to working or exercising in a hot environment, start slowly and pick up the pace gradually. If exertion in the heat makes your heart pound and leaves you gasping for breath, STOP all activity. You should get into a cool area or in the shade, and rest, especially if you become lightheaded, weak, or faint. The most efficient way to beat the heat is to stay in a cool or air-conditioned area. If you do not have an air conditioner or evaporative cooling unit, consider a visit to a shopping mall, see a movie in a movie theater, or visit a public library for a few hours. Contact your local health department to see if there are any heat-relief shelters in your area. Electric fans may be useful to increase comfort and to draw cool air into your home at night, but do not rely on a fan as your primary cooling device during a heat wave. When the temperature is in the 90s or higher, a fan will not prevent heat-related illness. A cool shower or bath is a more effective way to cool off. Also, use your stove and oven less to maintain a cooler temperature in your home. If you must be out in the heat, try to plan your activities so that you are outdoors either before noon or in the evening. Resting periodically will give your body's thermostat a chance to recover. When working in the heat, monitor the condition of your coworkers and have someone do the same for you. Heat-related illness can cause a person to become confused or lose consciousness. During a heat wave, have a friend or relative call to check in on you twice a day if you are 65 years of age or older. If you know anyone in this age group, check on them at least twice a day. Be aware that any sudden change in temperature, such as an early summer heat wave, will be stressful to your body. You will have a greater tolerance for the heat if you limit your physical activity until you become accustomed to the heat. If traveling to a hotter climate, allow several days to become acclimated before attempting any vigorous exercise, and work up to it gradually. Avoid hot foods and heavy meals as they may add heat to your body. Do not ever leave infants, children, or pets in a parked car. Dress infants and young children in cool, loose clothing and shade their heads and faces with hats or an umbrella. Make sure they use sunscreen when outdoors. Limit sun exposure during the mid-day hours and in places of potential heavy sun exposure, such as beaches. Make sure to keep your pet cool by giving them plenty of fresh water, and leave the water in a shady area. What are the triggers or causes of your heat-related illness? How do you avoid these triggers? What were your symptoms of heat rash, and what was the treatment? Please share your experience with heat-related illness. What were your symptoms associated with a heat-related illness? What were your symptoms of heat exhaustion, and what was the treatment? Drinking water benefits digestion, metabolism, toxin elimination, and other functions. Water promotes weight loss and helps prevent dehydration. Health benefits of hydration include improvements in mood, skin health, and ability to work out.